Spell Kits for Money and Prosperity. Each component and kit are tried and true instruments to bring you the results you deserve. With these tools you can send the Universe a sign that you need more abundance and security! Great things are sure to follow. Handmade Money Candle: Our Money candles are made during the waxing moon in a prosperous sign. Infused with oils, and herbs with empowered symbols carved into the wax. A very powerful tool. Choose below what you would like your candle to do for you. Money Incense Gift Pack: This set is rich in fragrance! Included is 5 sticks of each of the following luxurious scents: Mint, Cinnamon, Egyptian Musk, Patchouli and Clove. A decorative burner is also included. Money Oil Gift Pack: Smell the money. Create an atmosphere of abundance by placing in a light ring (included). Or wear on your skin to empower you. .Includes one 2 dram vial of each scent: Fast Money, Debt Be Gone, Mint, and Patchouli. Plus a light bulb ring in which to burn your oils. Prosperity Bath Kit: Wrap yourself luxury with softening golden waters. Open yourself up to wealth with this pampering magickal bath kit. Includes two packs of Mermaid Money Bath salts, One handmade Prosperity candle, and a 2 dram vial of Prosperity Now oil. Money Spell Herb & Crystal Kit: This component kit is for use in any money spell you can think of. Add power to your magick, with fine tools designed for success. Includes a 1 oz bag of the following herbs: Mint, Clove, Patchouli, Cat Nip, and High John. Crystals: One tumbled tigers eye, and one crystal quartz point (ready to be empowered with your intentions). Deluxe Money Kit: This kit is sure to please! Includes: 5 each of the following stick incense: Mint, Clove, Cinnamon, Patchouli and Fast Money. Also 1 oz bag of the following herbs: Patchouli, Cat Nip, Mint and Clove. There's more: One handmade Prosperity Now spell candle, One 4 oz bag of Mermaid Bath Salts (scent: money), a 2 dram bottle of Prosperity Now oil, and one Quartz crystal point. Gold Ink Pen Kit: Use this rare ink on your seals or talismans.Looks divine, and adds the fire power of the sun. Easy to use! Comes complete with dip pen (plastic holder with removable metal point). ½ fl. oz. Parchment Paper: Parchment paper is a favorite of ancient and modern spell craft. This paper adds power to anything written on it with intent. The more you put into a spell, the more you are going to reap from it! 5 pages in a plastic binder cover. Order as many as you like! Practical Candle Burning by Buckland, Raymond. Buckland's book, Practical Candle Burning Rituals, is great for doing any type ritual he has mentioned. It also is two sided...given you a Christian version for non-Witches and a Pagan side for Witches/Wiccans/Pagans to use. The directions are easy to follow and if you follow the directions that he has set for timing, moon phases, and use the appropriate colors your spell should work for you. Excellent book...easy rituals and great results! Paperback, 210 pgs. Advanced Candle Magick by Buckland, Ray. The authors first book on candle magick , "Practical Candleburning Rituals", is the classic text on candle magick. This book picks up where the previous left off, taking you to the next level in the art of candle magick. The new rituals presented are powerful methods that go beyond simple spells. Loaded with valuable tips, expert advice, and answers to the most commonly asked questions about magick, this book is an indispensable addition to anyones library. Paperback, 265 pages. Money Magick by Telesco, Patricia. Money may not buy happiness, but a wise witch knows that having no financial burdens certainly makes things easier. In the pages of this practical & clever book you will discover: how magick can help us inspire prosperity; what methods our ancestors used to attract riches; effective spells, charms, & chants to manifest providence; food, beverages, & aromatics for bountiful blessings; astrology & feng shui for stable finances; tools & techniques to reclaim abundance in every corner of life, not just our wallets. 221 pgs. Silver's Spells for Prosperity by Ravenwolf, Silver. There's nothing like a little magick for bringing prosperity into your life! This little gem of a book is packed full of magickal workings to help you create abundance, get out of debt, & make money a positive force in your life. 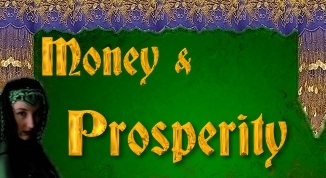 Learn how to prepare incenses, oils & more for prosperity; manifest desires through the Golden Cord; banish debt by construction a Magick Bill Box; invoke the elements for financial assistance; plus dozens of spells for bringing bounty to your bank account! 230 pgs. Amulet Money Tree: This great amulet is designed to make your money grow. A customer Favorite! Approximately 1" by 2". Amulet Schemhamphoras:. From the 6th and 7th Books of Moses. Attracts money and customers and great success in business/finance. Approximately 1 1/2" diameter.